The setting : A yoga conference in Hardwar. A sadhu in ochre, with a face radiant as the sun, a gaze as deep as the ocean, walked towards the venue with measured steps and a dignified gait. A volunteer enquired in half amusement, “Maharaj aapka car kahan hai? “. A second’s silence later, the sadhu drew a deep breath and with gaze turned inwards replied, “Hamara car om-kaar hai” and walked on unperturbed. The sadhu was Sri Sri Rangapriya Swamiji. In an age where commercialisation has invaded even spirituality, he was single-minded in his pursuit and advocacy of spirituality and simplicity. In his later days when material comforts came to him unasked, he remained unattached to them, ever ready to relinquish them. Born H.S. Varadadesikacharya, he spent his childhood in his native village of Hedathale, 40 kms from Mysore where Sri Ranga Mahaguru, a yogi par excellence took him under his wings. Sri Ranga Mahaguru was a rishi who lived in self-imposed obscurity and chose to carry on his mission through the agent of his chosen disciples. HH Rangapriya swamiji pursued spiritual knowledge under the tutelage of his guru, while absorbing from him the quintessence of the multifarious culture bequeathed by our ancestors. In furthering the mission of his Guru, he spent well over four decades as the secretary of the Bangalore branch of Astanga Yoga Vijnyana Mandiram, a spiritual institution established by Sri Ranga Mahaguru in the year 1947. He pursued traditional studies at the Maharaja Samskrita Pathashala at Mysore and later obtained his M.A from Saugar University in Madhya Pradesh. An erudite scholar of repute, he used his mastery of Vedas, Upanishads, Dharma shastras and many other traditional texts to expound their direct connection to the inner experience of the sages of yore. While scholarship is generally associated with dry rigour and incomprehensibility to the common man, HH Swamiji was a teacher par excellence with a penchant for conveying his message in clear and simple language to the scholar and simpleton alike. As reader and head of the department of Samskrit at the National College, Basavanagudi, he was adored by his students and colleagues alike. Students of other colleges flocked into classrooms where he taught the nuances of Samskrit and extolled the beauty of Kalidasa’s works with wit and candour. In spite of his fame and punditry, he remained at heart a fervent devotee, and his lectures overflowed with the nectar of spiritual emotion. His narration of the stories of ardent devotees like Dhruva and Prahlada always moved the audience to tears. His rendering of the life and divine pastimes of Krishna and Rama transported the gatherings to the hoary past filled with heartrending devotion and unflinching sense of duty. His zeal to carry out the mission of his guru drove him to exert himself every minute of his time, influencing the lives and minds of those who came in contact. He was always surrounded by dozens longing to hear him. Yet he himself remained a renunciate unattached to everyone. 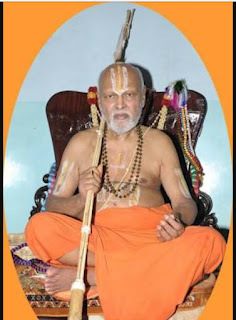 When he formally entered sanyasa in the year 1988, HH Abhinava Bharati, the Shankaracharya of Sringeri Shankara Matha remarked that HH Rangapriya had only exchanged his white linen for ochre robes, for he was always a renunciate at heart. That doyen of devotion, dedication, scholarship, spirituality and simplicity attained immortality on 29th march 2012.